In the last three posts I have been discussing the quantity of heat that is created when machine tools are used in the cutting of rock, metals and other materials. 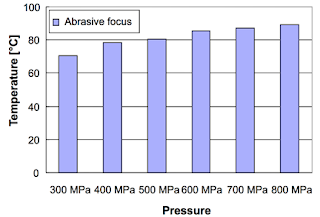 The amount that the temperature of both the cutting tool and work piece material will increase, and the effect that this has on the cutting tool and the finished part can, as I have shown, be reduced if a quite small stream of high-pressure water is directed into the small zone where the cutting is taking place. But what happens if the cutting process doesn’t use the large scale typical mechanical cutting tools, but instead uses the very small particles embedded within the jet stream itself as part of an abrasive waterjet cutting system? For many years the evidence, after the cut was over, indicated that there was very little heat build-up in the part, and the process appeared to be a “cold cut,” but there was no immediate evidence, because of the rapidity with which the cut was made. However, with advances in technology that limitation was removed, and research scientists at the University of Hannover have now been able to make temperature measurements during cutting. 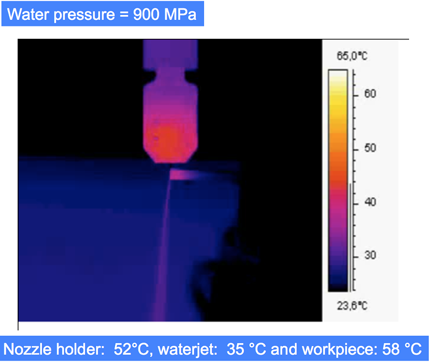 (A Thermographical Map of Tool and Workpiece During the Cutting Process by Plain Waterjet and Abrasive Waterjet up to 900 MPa, H. Louis, A. Schenk, F. Pude and M. Mohamed, 17th International Conference on Waterjet Cutting Technology). The group used an infra-red camera connected into a computer to capture images as an abrasive waterjet cut into a target work sample. The instrument had been calibrated to show the color temperatures that the image revealed. Figure 2. 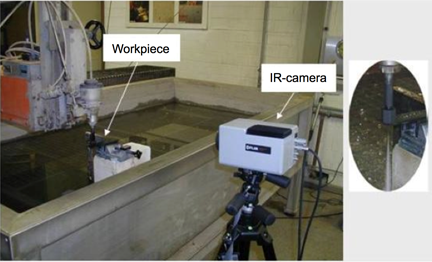 Experimental arrangement allowing capture of the temperature build-up in the cutting head, the abrasive jet and the work piece during an AWJ cut (H. Louis et al, ibid). During the course of the experiment the size of the cutting jet and the pressure were changed to find how these controlled the temperatures that were generated in the different parts of the operation. The work first examined the results when only a plain waterjet, without abrasive particles, was used in cutting. 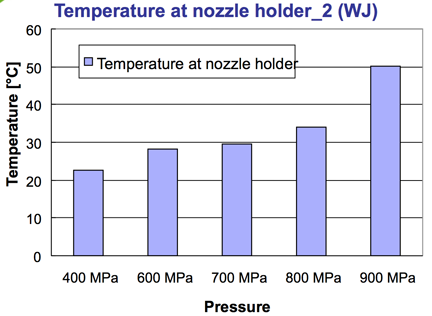 Note that there is not a large amount of heat generated in the part, in this case a temperature rise to 126 Deg F was measured, though the temperature rise in the nozzle holder was similar in range. When the effects of jet flow and pressure were plotted, the role that an increase in pressure played in raising the part temperature around the cutting zone is clear. Note, in Figure 3, the region over which the temperature has been raised in the work piece. 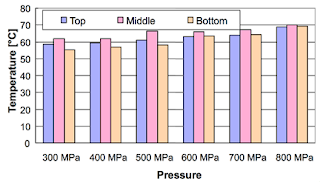 Note that at pressures of up to 100,000 psi (700 MPa) the temperature rise is only up to 86 deg F, much less than that in conventional mechanical cutting. 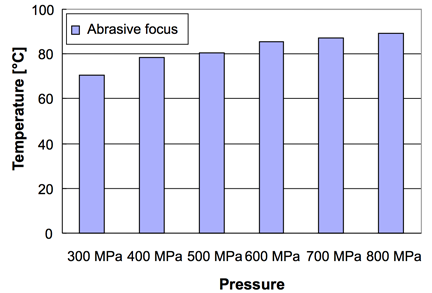 When abrasive is added to the jet stream, then the temperatures generated, as Figure 1 indicated, are higher in the nozzle holder, because of the impact of the particles with the focusing tube as part of the particle acceleration. The piece was moved under the jet at 1.2 inches/minute, with an abrasive feed of 0.06 lb/minute, with jet pressures varied from 42,000 psi to 115,000 psi. (300 to 800 MPa). The target was a metal alloy. Not surprisingly as the pressure in the jet increased, so did the temperature in the focusing tube. Figure 5. Temperature increase in the focusing tube, as a function of jet pressure (H. Louis et al, ibid). Figure 6. Temperature build-up in the work piece during the cutting operation (H. Louis et al, ibid). 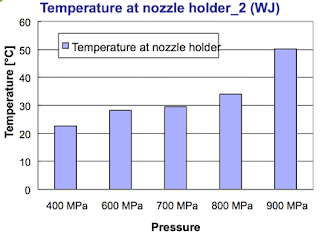 The graph shows that the temperature build-up is greatest in the middle of the cut, although this difference is small, and begins to disappear as the jet pressure increases. At 100,000 psi the temperature can rise to 150 deg F.
In most cutting work that temperature rise would not be enough to cause any damage to the part being cut. 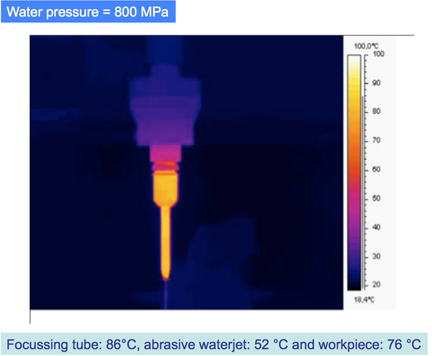 Where very temperature sensitive materials have been cut with the jet at lower pressures and higher speeds at MS&T the zone of influence of the cutting operation was measured in microns. It is in living tissue, which can be more sensitive to temperature, where this can be a problem. The University in Hannover is internationally recognized for the work that it has been carrying out in to the use of high pressure waterjets in medical applications. 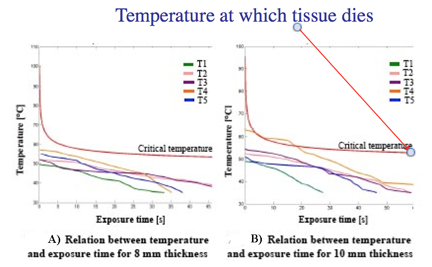 While this is a subject for another day (or several since the range of applications continues to grow from year to year) the caution comes from work on cutting bone and reported at the 18th International Jet Cutting Conference in Gdansk by Biskup et al “Temperature measurement during abrasive water jet cutting of cortical bone measured by thermocouples”). Bear in mind, however, that one of the problems that the technology is seeking to address in these bone cutting experiments is to achieve a better quality cut than can be achieved with a hand saw, which has often been the tool used by a surgeon when dissecting bone, and the required edge quality is sometimes more difficult to achieve with that tool. It can be seen that a thicker bone sample does become vulnerable to too high a temperature if there is a significant exposure time before the part is pierced. 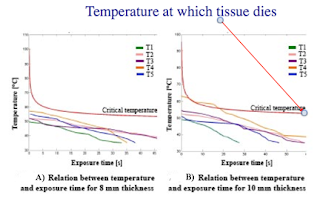 However, with an appropriate selection of parameters the temperature can be kept down in a range where the tissue does not die, and the considerable advantages to jet use can therefore be used. Keeping the parts being cut cool is important in very delicate and precise work, where thermal distortion of the metal, particularly in thin but deep cuts, can otherwise lead to unacceptable failures to maintain tolerance. your explanation way on waterjet cut is fantastic.I have got many tips on waterjet cutting services from your blog.Thanks for sharing with us your post. Thanks for sharing such a nice info with us. I appreciate this blog regarding waterjet cutting services.